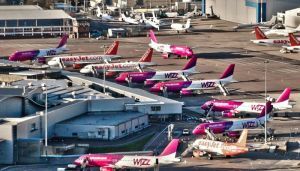 The check-in queue for Wizz Air at Luton Airport appeared to be lengthy and a wait feared, but there was no cause for alarm. The staff worked quickly and within 30min of walking into the terminal from the National Express coach, I was checked in, passed security and searching for somewhere to sit. Our aircraft arrived, there was a swift turnround and after a steep climb out of Luton we headed east at the start of a 4hr 50min flight to Tel Aviv. I had not eaten or drunk anything before flying as I wanted to give Wizzair a fair chance and try its menu. I chose a ham sandwich produced in Hungary. It deserved full marks and was part of a “meal deal” along with a chocolate biscuit and a bottle of orange juice. Cost: €7, a fair bargain. The expected flight time of about 4hr 30min provided opportunity for me to talk with the cabin crew and explain my being aboard the inaugural was to write a report for BTN. International law since 9/11 prevented me visiting the cockpit during the flight to meet Captain Gelanluca Felici and his first officer, but I did enjoy a lengthy chat with purser Zsuzsanna Pehl. After landing at Tel Aviv, the aircraft was parked some distance from the terminal and passengers faced a lengthy drive over what seemed to be at least 1km, judging by the time taken. In such cases who organises the buses? As with my experience at other airports, only one bus was provided at Tel Aviv and every passenger was crammed into it in a way reminiscent of some Indian and Japanese trains. Arrival at the terminal was just over 20min after the aircraft came to an halt. Once through immigration, a pleasant drive to the National Hotel in A Zahra Street, Jerusalem, ended the day. Wizz Air was the 278th airline I have flown, the only disappointment being no mention was made of W6 4451 being an inaugural, and I appeared to be the only one celebrating! However short a time was arranged for me to visit Israel, as an aviation enthusiast I had to make an effort to enjoy one or two domestic sorties. I was able to make a reservation aboard Arkia Airline flight IZ 5803 from the small Sde Dov town airport of Tel Aviv to Eilat some 168 miles south. 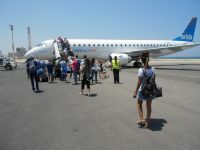 Unable to book a return flight with Israir, the other domestic airline, loyalty demanded I should enjoy a second flight with Arkia, this time aboard its newest Embraer 190 back to Sde Dov. J Hozman Airport at Eilat is named after the founder of Arkia, Yakov Hozman and is some 12km south of the village of Avrona, mentioned in the Book of Numbers of the Torah. The airport is small, neat and tidy and one can simply walk from the aircraft through the lounge on to the street where there is a wonderful map waiting to guide the visitor. A meeting with airport manager Hannan Moscovitz gave me an insight into local history and modern-day industry and I was then offered a chance to see where Ramon Airport is being built. As we headed north, the control tower for the airport came into sight and a few hundred yards further on I was able to take a photograph of the departure terminal in the early stages of construction. BTN has reported on the airport and nearby nature reserve, which I saw. Progress is slow! My only disappointment was time did not permit me to cross the airport runway and view a DC3, 4X-AES, a former member of the Arkia fleet, standing in honourable retirement at the edge of the apron alongside the runway end. The purpose of my visit to Israel was not of a religious nature but given my enthusiasm for air travel to experience and report on the new Wizzair service from Luton. However, how could I fly into Tel Aviv and not make the effort to see the Holy City of Jerusalem? It was holiday time and suitable accommodation was hard to find given my chosen hotel in the centre of Tel Aviv was suddenly cancelled. At short notice I had to discover another so chose to stay in Jerusalem. The result was an excellent but expensive private ride to the National Hotel, worthy of note and with excellent service. I spent my first morning with a simple map provided by the reception desk searching the old town for the places of interest, including the Western Wall, the chief synagogue and mosque and the well known churches. I was able to walk around parts of the wall both outside and inside and take photographs as keepsakes. I had arrived after sundown on the last day of Ramadan, the city was in celebratory mood and there was nowhere for taxis and cars to park. It was difficult for my driver to get to the hotel and I was told there would be noisy celebrations all night. Being tired however, I soon fell asleep, waking on the Sunday morning to discover Jerusalem like a ghost town, with no one about. I had not been able to change money at the airport and the hotel would change only US dollars, not sterling. In my search for an ATM, I had to wade through the litter on the streets, bottles, paper and rubbish of all sorts. Perhaps the amount lying about ought to have an entry in the Guinness Book of World Records. 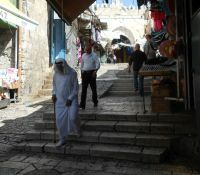 There can’t have been many other places with more litter than Jerusalem had on the streets that morning. Despite that, I have to say I spent a very enjoyable day in the Holy City of many faiths. Brother Michael will continue his story in a future BTN. Anti-Semitism is a dangerous word to throw around without basis in fact. It is not the same thing as opposing multiple human rights contraventions, of which the state of Israel has been accused. The celebration of Id Al-Fitr (the end of Ramadan) and rubbish left on the streets of what is an exceptionally clean city (Jerusalem, where I lived for ten years) shows how multicultural Israel is and how tolerant of its often hostile Arab minority, especially in Jerusalem and its surroundings. This gives the lie to the hysterical screams of "apartheid" from the antisemites who predominate in the British media, especially the BBC.